A few issues have moved on since last year, and my take on word-of-mouth in the book will be slightly different. But here's the full article, with hyperlinks and links to related articles. The music industry has several established methods to promote acts — press ads, reviews, airplay, posters and in-store display — and in the era of converging media they are exploring new techniques from blogs and permission-based email/SMS, to promotional downloads, videogame tie-ins and exposure in film and commercials — all of which are growing in value. Do all these efforts affect the word-of-mouth buzz about an act? Could they? Or should word-of-mouth be left to evolve on its own? Some industry PR activities aimed at influencing word-of-mouth have backfired publicly in the last few months. At the end of 2004, media exposure led Universal to suspend a campaign that encouraged children (who were rewarded with in-kind gifts) to promote Busted and McFly to their friends at school. In online communities earlier this year, there was an exposé of a PR campaign that posted identical messages to several forums in an attempt to limit the damage to Ashlee Simpson of a poorly received TV performance. In the US there have been job adverts for "Online Marketing Ambassadors to chat and write message board messages" in shifts. 'Word of mouth' is a tricky concept that people rarely define when they talk about it. You've probably seen the questionnaires that ask, "Where did you hear of this album/artist/service/etc" and after the list of advertising media and marketing campaigns, just before you get to "other (please specify)", it says "word of mouth". What is really meant by this? It used to be a fairly literal description of the patterns of oral conversation that swept though workplaces, bars and playgrounds. Organic and uncontrollable, word-of-mouth has been something that marketing departments might seek to prime with street teams, but in the end it can be like knitting fog. When the conversation goes digital, the words in word-of-mouth are easier to copy, to search, to archive. With the conversation being trackable, does that make the problem of influencing, and capitalising on, word-of-mouth more tractable? 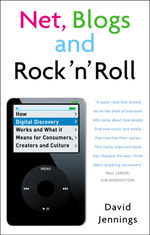 Tim Rabjohns at MotiveQuest reports that "music is the single most discussed topic online". MotiveQuest's 'online anthropology' techniques enable them to listen in to all forms of text-based discussion on the net: "we can analyse blogs, web forums and chat, and we can compare what consumers are saying about a band with what the mainstream media are saying — this provides valuable intelligence for the industry". This article assesses how 'digital word-of-mouth' operates, with particular focus on online sharing of playlists. It looks at the emerging patterns for how word-of-mouth spreads online, and the implications these have for the industry. Traditionally word-of-mouth has relied on a combination of 'recommendation' and 'sampling'. Recommendations include some established media such as press, but are generally thought of as the under-the-radar 'buzz' that circulates informally — and simply, as in "the new Coldplay/Bright Eyes/Rilo Kiley album is really good" — through everyday conversation. Sampling may include tracks heard on the radio, though it also involves music heard at friends' houses, albums borrowed from work colleagues, and — whisper it! — home taping, including the tradition of giving mix-tapes to friends. The recommendation and the sampling don't necessarily come at the same time, or even in that order. Often someone will mentally file away a recommendation of a new album until they get the chance to sample it, perhaps when next catching a lift in a friend's car, browsing through their CDs: "I've heard of them — can I borrow the album? Is it as good as the reviews?" This de-coupling and delay between the initial trigger of interest and follow-up through listening, and ultimately purchasing, is one of the factors that makes word-of-mouth so unpredictable. How does this mixture of recommendation and sampling translate online? There are many models that combine them in different ways. The Weed service enables you to sample full tracks before you buy. You are rewarded by earning commission for recommending tracks you've bought to friends — though, beyond that, the 'community' features of Weed are limited. By contrast, MySpace puts people and community at the heart of its offering, but has also offered exclusive streaming of pre-release albums to give the community something to talk about, hoping to generate that elusive buzz about the album. MP3 blogs and podcasts usually combine fan/DJ-style comment with full or part-tracks. However, licensing issues make these outlets at best a grey area legally — unless rights owners have given permission. The major labels may see the recent US Supreme Court 'Grokster ruling' as grounds for clamping down on this, though unsigned acts and parts of the independent sector may see the benefits of publicity and reaching an audience as outweighing modest losses of revenue. Many online music services now have some playlist-sharing functionality built in, often including the ability to hear full tracks or samples from these lists. The 'recommendation' element of playlists is implicit, and the emphasis is on listening to the music itself. The latter part of this article focuses on playlists at greater length. One service that's missing from this list is the 'original Napster' style of peer-to-peer (P2P) filesharing applications. These have all tended to be anonymous and lacking in the communications or publishing features to enable recommendations to spread. Though P2P services may sometimes feed a buzz, the buzz has to start elsewhere on the net, in community and blog sites, since a big database alone is not fertile ground for word-of-mouth. In face-to-face conversation, word-of-mouth spreads through solicited and unsolicited opinions, as well as more subtle observations of, say, what co-workers choose from the jukebox in the bar after work. All of these 'channels' blur into each other. Similar channels operate online, but technology — and the larger, more anonymous, scale of conversation that it allows — makes the distinctions between them more clearly drawn. Think of blog sites, fan forums and email lists, or community sites, and it is explicit that people are publishing their opinions with the intent, or awareness, of influencing others' opinions and listening habits. Opinions are pushed out to people. My earlier Five Eight article (Issue 36, November 2004) discussed the issues for the audience in sifting and keeping up with these disparate perspectives, and how to become a 'trusted source' of recommendations. Word-of-mouth can also operate implicitly online in at least two ways. One consideration is that people are not passive or mechanical interpreters of the opinions they read online: they don't take everything at face value; they join the dots and read between the lines. Researchers refer to this kind of unconscious information sifting as 'tacit learning'. Without necessarily planning to, people filter inputs from many sources and pick up hints and lessons from people who didn't even realise what others might learn from their words. One person's reference to 'self-indulgent jazz-prog noodling' may be interpreted by another as complex and intricate virtuosity. This subtle learning is invisible except in its effects, and, of course, very difficult to control or influence. In the course of this learning, people's evaluations of specific artist are in constant flux. At some points, this flux may be punctuated by decisions to purchase an album or a track — and clearly that is the goal the industry is interested in — but individuals' paths to this decision are unpredictable, and buffeted by more and more sources of information of variable degrees of quality and trustworthiness. Another form of implicit word-of-mouth occurs online when net users do not directly publish their recommendations but an intermediary service infers recommendations from their behaviour, and then either publishes the recommendations or uses them to tailor playlists. Examples of this include Amazon tracking purchasing behaviour to make recommendations to their customers of other albums they might like, or streaming services like Last.FM or LAUNCHcast which track users' listening and ratings to generate playlists for people with similar interests. You could call this a kind of 'tacit recommendation'. Though it's arguable whether such collaborative filtering counts properly as word-of-mouth — since no words are involved — an increasing number of online music services are using these techniques in conjunction with community features as a complementary means of guiding their users to music they might like. To summarise, there is a range of types of word of mouth — from explicit, 'push' models like podcasts to implicit, 'pull' models like Last.FM's personalised online radio. Other channels may be positioned elsewhere on the spectrum, but individual punters are likely to draw on several of them to reach their conclusions. At the start of this article I referred to traditional methods for marketing and promoting artists' new material. Clearly industry 'street teams' can do valuable work to seed promotional messages, online and offline. However, the PR machine may be able to influence word-of-mouth but it cannot control it. Trust is a commodity it's easy to lose and hard to regain. It's important for the industry to remember that the energy that fuels word-of-mouth has its basis in communities and relationships — the desire for people with common interests to associate freely with each other. So there is a natural backlash against any 'outside' attempts that are seen to pervert the natural evolution of discussion and recommendations. The more sustainable approach to influencing word-of-mouth is to work with the grain of normal procedure and etiquette in online conversations. This is where online communities may come in. Promotional techniques — such as exclusive album streams on MySpace — are accepted when they are clearly signalled as such. Attempts to place positive messages in communities should be based on the principle of planting seeds rather than blitz coverage. Striking this balance is an art rather than a science, but if you remember that the goal is to build trust, then it's clear that values of honesty and transparency play an important part. Do not pretend to be an 'ordinary punter' if you are not one. People will tolerate promotional messages and interventions if they are used in moderation, indicate clearly that they are motivated by a desire to promote an act, and, especially, if they provide community members with something they want as part of a quid-pro-quo trade (see the exclusive streams of R.E.M. and Oasis albums on MySpace, for example). In time it will become clear where there is fertile ground and where you are wasting your time, and then you can concentrate your efforts accordingly. For acts that are starting out, the only option for spreading word of mouth initially is existing communities that focus on music. In these circumstances it is difficult and labour intensive to track which community members are most interested in your artist. For more established artists — or labels, such as Warp, that have strong brand identification — it may be possible to build your own community of interested punters. And when you control the technology, your scope for automated collection of Customer Relationship Management (CRM) data is much greater (though again, building trust requires you to be open and responsible in respecting community members' concerns about privacy and permission-based marketing). Where do playlists fit into the spread of word-of-mouth recommendations? There are several factors at play. Being both cynical and pragmatic, one factor is that lists are one of the laziest forms of writing, and with many playlist applications or services you can compile a list using 'drag and drop', with no writing at all. That makes playlists attractive to people who lack sufficient confidence in their writing to write wordy recommendations and articulate reviews. Seventy per-cent of MySpace users are aged between 16 and 34, and other community sites like LiveJournal have even younger demographics. Many LiveJournal posts consist of nothing but lists of tracks or albums that the author has got or would like. But list-making is not restricted to teenage journal writers, as even broadsheet newspapers have published articles that consist of nothing more than a collection of celebrity playlists plus sixty words of introduction. Apart from being easy to produce, playlists also have a sustained fascination for readers and users. As critic Paul Morley wrote in his book Words and Music, "The list is what brings a world of chaos into some kind of pattern… Everyone loves a list for making sense of the awesome nature of all the stuff that surrounds us." Traditional media are starting to adapt to a world where their 'gatekeeper' role of one-directional programming is shifting. To take the example of radio, programmes from Radio 3's Late Junction to 6 Music and Radio 1, are opening more opportunities for listeners to suggest short playlists or for 'celebrity programming' where well-known artists broadcast their own selections from the BBC archives. Finally, playlists come into their own as an 'interface' to catalogues of over a million digital tracks. The iTunes Music Store has featured celebrity playlists as a sales promotion tool since soon after its launch. But, compared with à la carte services, playlists are even more valuable with subscription services — like Napster, Rhapsody and (launched only in the US so far) Yahoo! Music Unlimited — that offer access to huge numbers of full tracks all at once. Faced with such massive choice, many subscribers value a bit of 'hand holding' to guide their listening. Subscription services allow sampling and 'grazing' by users, when they just want a sequence of tracks to play almost automatically, like the radio, with no user effort. Playlists offer a quick way to provide this experience. This, along with the other factors mentioned above, may be what led David Goldberg, Vice President & General Manager of Music at Yahoo to be quoted claiming "the playlist is the killer app in music". Playlists can be implicit, in the sense described above, as when Last.FM configures a personalised playlist for its users on the fly, according to their preferences and those of others like them. Research published at a recent US usability conference shows how sharing iTunes libraries and playlists over a workplace network affected how co-workers projected their personalities to each other, consciously and unconsciously, as well as discovering new music in the process. However, playlists become more visible as a vehicle for word-of-mouth when they are published openly. On his web site, David Byrne provides a playlist with streaming audio, and explains its motivation in terms of letting a friend keep in touch with "the odd variety of music that was played around the office". Webzines and more mainstream music press, such as Word and Q, use online radio platforms like Live365 and TotallyRadio to provide audio selections to accompany their writing. But real word-of-mouth is punter-to-punter communication, and several sites provide ways for their users to publish their playlists, possibly providing 'liner notes', and comment on others' lists. In some cases (e.g.Soundflavor) these provide direct links to samples of the tracks in the playlist, and/or (in the case of upto11.net) links to purchase the tracks via online retailers and download stores. The Art of the Mix site started nearly eight years ago, growing out of a community of mix-tape sharers: it has no e-commerce partnerships, though playlisters can provide links to samples or full-tracks if these are available elsewhere on the net. Webjay takes this one step further, being primarily oriented to playlists of tracks that are freely and legally available online: once the playlist is compiled anyone can listen to it with their favourite media player software, without needing to download any of the tracks. The constraint of choosing from freely and legally available tracks limits the range of tracks that webjay can be used for. Used in conjunction with one of the subscription services, this limitation is removed as users have access to very large catalogues of tracks. Looking to a future where subscription services are expected to become more widespread, webjay and Yahoo! Music Unlimited are adopting the XSPF (XML Shareable Playlist Format, pronounced 'spiff'!) specification so that playlists created on one service or for one community can be ported to others [Update, June 2006: since this article was written Yahoo has bought webjay.]. If take-up of this format becomes widespread, it will help playlists become the common currency of digital word-of-mouth. Word-of-mouth morphs all the time across different communications channels. These changes are driven not only by technology but also by local/national market trends and historical factors. Against this backdrop of change there is scope for innovation, both in new channels and services, and in the exploitation of these services to gain exposure for new artists. Playlist-oriented services are by no means a sure-fire area for significant growth — early offerings like Uplister closed down in the wake of the dot.com crash — but it is clear that audiences need something to help navigate the "awesome nature [and quantity] of stuff that surrounds us". Word-of-mouth will persist alongside collaborative filtering and other sophisticated technological fixes: the social urge to share enthusiasms is habitual and instinctive. As has always been the case, the industry needs to work with this and seed conversations that promote their artists without seeking to control the conversations. Increasingly that means engaging with emerging practices in playlist sharing, as well as blogs, forums and possibly podcasting, to ensure maximum chances of exposure through these channels.